Rover Computers debuted on the PDA market with Rover P6, a specific model with a large screen and average sales. Released on the New Year Eve (December 2002) Rover P3 strengthened company's positions on the PDA market. Every adventurous expectation came true, Russian users welcomed that low-end handheld listed for $300. Unofficially company's leaders had been spoken about a smartphone under Rover trademark for a long time, and by the end of 2003 it happened. Well, meet Rover S1 ("S" stands for smartphone) - the first Russian smartphone. We'll review its flaws and merits. However the device is not Russian in full sense (like other Russian computer equipment). It is produced by a Taiwanese corporation Wistron, and Rover undertakes product localization, distribution and support. To my mind the line between the “smartphone” and the “communicator” is artificial and unjustified. Until the middle of the 90-s telecoms industry and mobile computing developed simultaneously. An inevitable integration process broke out with the appearance of Nokia 9000 in 1996. Since then we witness two pronounced tendencies. On the one hand handsets involve more functions custom to pocket computers. On the other hand more and more handhelds go with cellular phone modules (integrated or not). It’s an irreversible process advancing swift and totally erasing distinguishing line (“ordinary” phones and handhelds will stay, but there will be not many of them). Even now you can hardly classify some devices. For example, how do you call Sendo X with a button-up keypad? On the one hand it is a classic smartphone powered by Symbian OS, on the other hand its keypad provides a quick text input (a communicator?). But it looks like a habitual mobile phone. Step by step classification will get more complicated (any criteria won’t do when such systems like voice recognition, manuscript input and form-factor change prevail). Hence in conclusion let’s put the “smartphone” and the “communicator” as synonyms. To complete the discussion we should formalize the notion. A smartphone (communicator) – a mobile pocket device powered by a full-fledged operating system (Symbian, Linux, Windows Mobile for Smartphone, Windows Mobile for Pocket PC Phone Edition, Palm OS) and equipped with an integrated communication module. I assume it may be a vexed definition, so I invite you to our forum to discuss it. 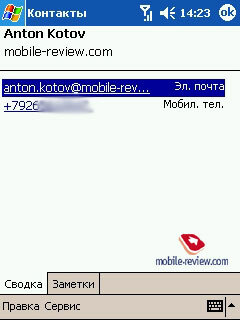 Now let’s start the review. Before the appearance of Rover S1 there were several devices of similar class on the market. Let’s call them: MiTAC Mio 728, Eten P600 and great variety of HTC (MDA, XDA O2) clones. Rover S1 takes advantage with its dimensions – it is notably smaller in length and width, but similar in thickness. The device measures 109x68.5x21.6 mm (without antenna). Compared to iPAQ 19xx it keeps the same width and length, but is twice as thick. It comfortably fits the hand. While talking with the communicator close to the ear your palm covers the device at 70%, so people around you won’t notice a wired device at your head. However it’s not a remedy against curious, in this case only the hands-free from the standard kit helps. The smartphone is a heavy one (158 grams), but does not weighs down your jacket pocket. Considering dimensions it is far from a handset, but is no longer a “brick” like MiTAC Mio 728, for example. The battery looks attached to the back side, as though there was not enough space for it inside. However it is fixed safe, you should even try hard to undo or place it back. Below the battery there is the section for a SIM card, which is quite common and easy to use. I should point at the asymmetric dislocation of the screen, it is aligned to the left. There are two variants of panels for the front side. In the first case you have two keys Talk and End with the microphone placed between. 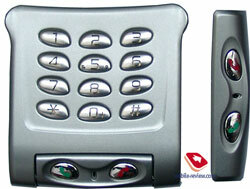 The second variant adds a digital keypad. But in this case the smartphone looks no longer attractive getting thick, besides the keypad lacks functionality (there is no Cancel key and no backlight, it’s impossible to enter PIN or reassign keys). As an alternative stick a protective foil to the screen and enter numbers on the screen with your fingers (since nothing would happen to it). Well, I didn’t like the keypad version. Given the fact that there are no application keys or joystick on the front side we conclude that this Pocket PC is not meant for gamers. The left side is crammed with control elements including the scroll/push wheel, two volume buttons and a useful Hold button (it disables screen and keys to spare power). On the top we find SD/MMC slot for memory cards, IR port and a headphones jack protected with a rubber gag. 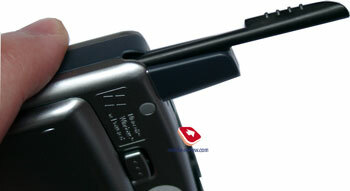 The stylus is stored in the antenna, has standard size and is very handy. It feels plastic, but if we drop it to a flat ground we’ll hear a metallic clang (sputtered plastic). The stylus is made of a high quality plastic. It creates an illusion of a metallic surface. The communicator goes with a rich standard kit. 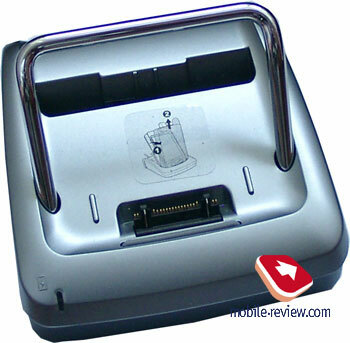 In addition to the above-mentioned panels there is a standard cradle with the socket to charge an extra battery. If you want to remove the device from the docking station just bend it forward. Should you forget to do it you can break fixing elements. It relates also to the direct plug, so treat the cradle carefully. 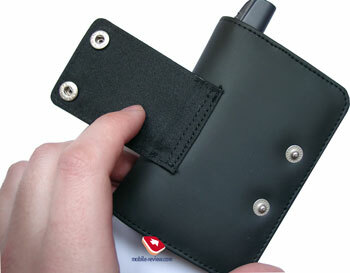 The horizontal case is made of artificial leather. It is fixed on the belt in an uncommon way, but that makes no problem using it. As for display we’ll describe it in standard words traditional for Pocket PCs: transflective, 3,5” diagonal, 65000 colors. You can see images at a wide angle in- and outdoors. Perfect brightness, saturation and white color rendering. However the minimum brightness level could have been lower (to read in the dark). There is no additional screen, so if you want distinguish between the modes (PDA/phone) look at the LED indicator, it blinks green in the phone mode. It flashes uniform, so you should insert SIM card, enter PIN or wait while the network sets. A short flash/pause – network found, double flash after pause – GPRS active, a series of short flashes – data transmission through GPRS. Press long the end key to shut down the phone and switch to the PDA mode. The PDA goes with a removable Li-Ion battery (1480 mAh). Under an active use (1 hour of talks, 1,5 hours of mobile Internet via GPRS, 3,5 hours playing mp3 files and an hour of other functions) the smartphone stood for 24 hours in conditions of Moscow network Megafon. At lower load (minus 2-3 hours) the device lasted for 2 days. Thus a fastidious user may account for 1-2 days on a single charge. Nevertheless the results look pretty good, particularly compared with Pocket PC smartphones of previous generation, which functioned maximum a day long at the average load. As we’ve already said this smartphone won’t suit gamers. Those who buy this model do not aspire to watch films on it. So productivity tests play a conditional role. We put two tables testing video stream and PocketQuake game. Note Rover S1 outpaces many other PDAs, including handhelds from Rover Computers. 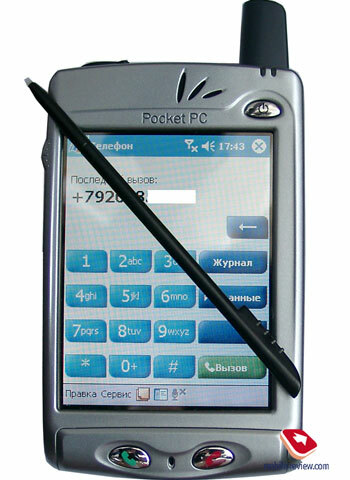 Initially Pocket PC operating systems (PPC2002, WM2003) aren’t meant to manage phone functions (unlike the special version Windows Mobile 2003 for Smartphone). 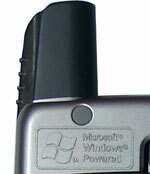 Rover S1 runs WN2003 for Pocket PC Phone edition, but still it is that Windows Mobile 2003 for Pocket PC Premium Edition (read the respective review) with extra applications providing phone functions. SIM manager. 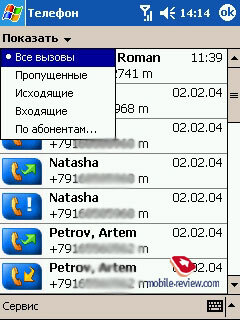 Edits SIM contacts, adds new entries, and supports the correct work with Russian language. That's all to do with SIM card. You'll face some difficulties as there is no SIM Media provided. For example, the phone cannot dial *102# to check the balance. That is the common drawback for Pocket PC smartphones. Phone. This application collects all voice call services (when you close up the digital keypad, the smartphone automatically switches to this application). In the standby mode you see the keypad and recent call, which can be dialed by pressing the hands-free button (no matter whether it is incoming or outgoing). The smartphone (or the operating system, to be more exact) doesn't support voice dialing without some special software. Call log. It contains full history about all calls indicating phone numbers, time and duration. That's very useful, you can filter entries on subscribers and learn the communication history. Favorite numbers. Put here often used numbers. There is a slight change in contacts compared with common Pocket PC handhelds, now you can dial numbers by touching with stylus the number from “Contacts” list. 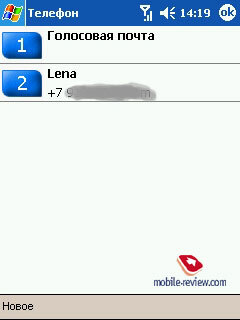 It’s an example of an incoming call (the smartphone switches to PDA mode). The standard software doesn’t support photos attached to the number, however some exterior applications enable this function. Other phone settings. They include only necessary points, no “excesses” like different ring tones for different caller groups and audio profiles (available only with extra programs). You can organize SMS and e-mails through Pocket Inbox. Only one extra application for back-up (not a phone one) is preset. All models are shipped fully russified (at the first launch you can chose between Russian and English languages). The russification is completed by Quarta Technologies, the company that cooperates with Rover Computers long and fruitful. There is nothing to claim to, it has been done well. As for the software (this conclusion is true for any Pocket PC smartphone) phone functions stay poor even against WM 2003 for Smartphone (which supports SIM Media, profiles), however exterior programs save the day. The smartphone is good at receiving signal; however in the zone of poor audibility you may hear dynamic crosstalk (a sound produced when the handset is close to dynamics). Dynamics are always loud enough, you can add your own melodies in WAV format (I never came across applications that set mp3 files as ring tones, but it’s just a matter of time, I think). During conversation you hear well your phone mate; moreover the maximum volume can injure your ear (now and then I had to distance the device from my ear). The vibro alert makes a strong effect; you’ll hardly miss it, even if you keep the smartphone in your outerwear. Listed for $500-$600 the device looks attractive in its class due to an alluring design and smaller dimensions compared with direct rivals. 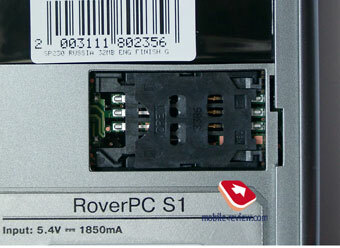 Rover S1 lacks an integrated camera and Bluetooth interface, that’s a weak point. Consumers concerned with that functions would prefer more expensive models, Sony Ericsson P900 or XDA II O2 (and other HTC clones). LED indicator: amber flash – notification, green – phone mode, uniform flash – insert SIM card, enter PIN, network search, short flash/pause – network found, double flash after pause – GPRS, a series of short flashes – data transmission through GPRS.